Great running everyone. It is so much more pleasant runner now spring is in the air! Hope you are better in time for your half enrvuk, good luck everyone with their training. My 10k went okay. I was recording consistent 8:40-8:45 minute miles, then my app lost it's satellite and went crazy. That said, that's something like a 54min 10k, nothing to be proud of but could be worse. A little sore today but not hopefully not in a concerning way. There is a big local 10k near me this weekend. I may enter as I've never been in an "event", a new experience. Although I certainly won't be troubling anyone with that time I may get a Jaffa cake. No Magnolias quite out yet in Norwich. We are a bit slow to latch on here. A lovely warm stroll out on the beach at work yesterday though + saw 9 Shorelarks. First taper run tonight - just a 3.5 miler to shake off the long run from Sunday. Nice to feel the pressure taken off me a bit now, but have noticed a few little worries creeping into my mind. Maranoia??? Magnolias are lovely Daisy, I used to live near a park with many of them and enjoyed walking there when they were in full bloom. Hope the knee is ok. Sorry to hear about the lurgy enrvuk. You probably won't have lost too much fitness by it and you can't catch up on training now pre HM. A couple of leisurely runs is a good idea - if you go out on Friday you could do a few strides or a mile at your intended race pace. Have a go at the 10k Linton if you have never done a race - why not try it out and see if you like it. With a time like 54 minutes you will likely have a lot of people finishing in front of you but plenty behind as well. Grr - not at all jealous of your beach Will. Enjoy the taper! 10 miles for me yesterday evening - partly solo, partly with my group. My right achilles has been talking to Cal's achilles and is grumpy but improved after a couple of miles. I also need to keep an eye on my left hamstring. Surprisingly niggly at the moment, hope I can run through it. Was a nice outing nonetheless - setting off at sunset and progressing into a lovely clear cold evening with plenty of stars. Glad you are over your lurgy, enrvuk. I'd keep it light and easy for a few days and maybe do a few strides Friday or Saturday to wake the legs up. You've got the miles in the bank so there's no sense in trying to push yourself at this stage. Consider the cold an enforced taper. 8 miles today for me - achilles less grumpy than yesterday, fortunately. I did two warm up, 5 at MP then one (and a little bit) to cool down. The first of the MP miles felt quite tough and was about 15 second slower than I wanted, but it was slightly uphill and I was still warming up I suppose. After that I got into my stride and the rest went well. Nothing of interest to note, although I am still enjoying the blossoms and daffs. I've seen a few flowering bushes I don't recognise, if anyone here has a horticultural bent. No leaves on them yet, just large, star-shaped flowers in white or a purplish pink. (Much, much bigger flowers than jasmine, with more petals. Deffo not magnolias or camelias which are also about at the moment). No idea on the shrubs I'm afraid though I did take more notice of the ones I ran past a while ago. The one magnolia I saw is thinking about starting to flower but if it is sensible it will wait a day or two as there is a nasty cold NE wind at the moment. Otherwise a lovely clear day for a run here. Needed a good one after two days of stress due to a server at work crashing and then waiting for a restore to be done without knowing if it would work (fortunately it did!). 7 and a bit miles - a bit overenthusiastic against the wind. Good running Cal and Hazel. I hope the niggles remain as just niggles! After 2 very needed rest days, I was glad to get back out on the road tonight. It was weird being out in the warmth. Was around 15 degrees out there this evening! My legs were feeling nice and light so I decided to go out and attack 4 miles (using the first mile as a warm up). I had a feeling I was on for a new fastest mile so I pushed for it and I was right, hitting 7:09. A whopping 20 seconds quicker than my previous best! One day that sub 7 minute mile will be mine, but for now I'll settle for that. Alipat - yeah I think we've turned a corner - it's definitely milder, and certainly a lot lighter. Well done on the mile. I never go that hard on a training run although I'll push myself each week at parkrun, and use that as my speed work. I did an early run today (just before 6) and decided to wear just a T-shirt (and my running tights, obviously...). Hands were cold for the first couple of miles but I warmed up pretty quickly, even though it was a recovery run and I was plodding. 6 miles done. Rather niggly again - I do feel them more after a rest day. That's a great fast mile alipat - nice one! After a couple of days' rest, spent thinking 'Have I done enough?' 'Shouldn't I be out there running?' 'Will I make it round?'. I got out this morning for a reassurance run of 10km. 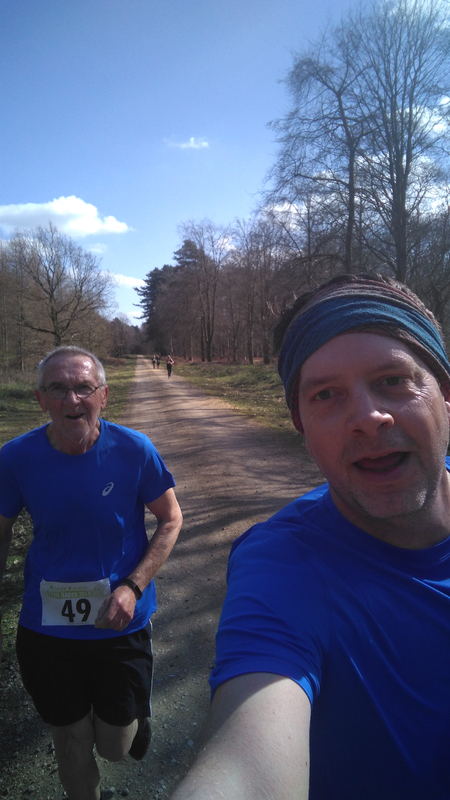 I'm running with my Dad on Sunday in his debut race, a nice trail 10km in the forest, so popped in 3 miles at decent 10km pace, finishing in 57 mins. Our target will be sub-60 so looking forward to seeing my Dad pin his number on. The family will all be cheering us on, so should be a good day. Legs are feeling solid, if a bit stiff, so going to get the roller out. Am trying to get some core work done before mara day. It's mainly consisting of dropping down at random moments to plank for 30 secs. Better than nowt I suppose! I must be the only one who prefers the cold weather. I always run in shorts and thin t-shirt no matter how cold it is. My best 10k and 5k in training were both done at around 4-5c. I dread the heat and will probably join a gym for July-late August. Thanks for the advice everyone, just finished a 5k last run before Sunday's half. First part was leisurely as intended, but realised the second half at 5:35/k pace was quicker than I meant. It was all a little harder post-lurgee (I am still a little chesty), but I'm glad I did it. Sunday will be a little less daunting than it would have been. Missing 9 days of running will temper my speed, which might not be a bad thing. My target is 2h5m, where I was starting to consider going for <2h. Good luck with your Dad on Sunday Will, I am sure it will be a great experience. I am trying to get my 77 yo Dad to do some Parkruns when he is in the country. Good plodding Cal and a nice mile time ali! Hazel, well done on the server restore! I prefer cold to hot, enrvuk, so long as the pavements aren't icy. I do wrap up when it's cold but my tolerance is a lot better since menopause kicked in. Conversely, I am rather unhappy when the temperature goes above 25 degrees, and I'd rather run in temps of 15 or below. Good luck with your weekend races, folks. That is a good mile time alipat. Ah - familiar taper thoughts Will. Looking forward to hearing how your Dad gets on in the trail race. Good luck to him. Add me to the "prefers cold weather" list enrvuk - you can always add layers but at some point there isn't anything left to take off in hot weather. Good luck for your HM! Good luck for anyone racing this weekend. Will, that should be awesome getting to go round with your dad. Not many people get such an opportunity so I hope you enjoy it. I went out for a nice and steady 10km this morning. Running conditions were pretty much perfect. Around 9 degrees, overcast and the finest drizzle you could ever imagine. Linton,that's a good 10k time.Give the 10k race a go,you'll love it,I promise!! Good luck for your HM,enrvuk,hope it goes well.I prefer cold weather training as well,just as long as it's dry though. Nice speedy mile,alipat,bet that hurt! Best of luck to your Dad and yourself,Will.Looking forward to your race report. Legs feeling heavy all week,don't know if it's the circuit training on the Monday,it's very competitive and I'm pushing myself to keep up with the young dudes.Did hill sprints on Wednesday but just couldn't get my legs going. 8 miles along the canal this afternoon,very busy with walkers and boaters.Spotted a grey heron,no doubt will have a beady eye on this years ducklings. Ah good luck to yourself Will, forgot that, sorry. Sluggish recovery earlier, a bit short of 4 miles. Strange legs, they didn't hurt but the quads were refusing to fire for the first half so my legs felt they were about to give way a couple of times. Felt ok by the end though. Hazelnut - my club organises the 5Ks of Christmas - some 5K races around Battersea track. They're divided into potential finish times so the slowest race (mine!) goes first and then the really fast peeps are in the last race. I've done that twice. The mile race is the Sri Chinmoy mile relays so you're part of a three person team. That is on the very flat roads inside Battersea Park but not the track. It's brilliant fun, though. Well done on your LT session. Not surprised your legs feel a bit shot today, though! Well done JD and alipat. I enjoy seeing herons - they appear on the Tooting pond every so often. There's plenty of fish in there. After yesterday sluggish and uncomfortable recovery run, I wasn't sure how parkrun would go but I ran an absolute blinder at Osterley and smashed my PB. 24:39 - only my second run under 25 and the first this year. I'm super happy with that. Osterley is really lovely - a National Trust property in west London with fields of Jersey cows and a stately home. There's an incredible 84 year old, Alan, who runs pushing his wife in a wheelchair (she has Parkinsons). He was a little over 40 minutes doing that today which is amazing. We (me and Cammy, the lady I get a lift with) had the pleasure of getting a coffee with them both after. I hope I have his energy when I'm that age. Ah that was it, I thought it was a mile rather than 5k you had done. That is a great pr time, I like your ability to get PBs over a whole range of distances. And the bonus of a nice location and interesting participants as well. I found out the hard way today that two days are not enough between the LT intervals and a 14 mile progressive run also ending with some LT miles. I had to press the reset button at around 8 miles with a brief walk and a drink (carried in my belt) and was tempted to can the run. Decided to at least do the planned distance and got going again. Was able surprisingly to build up some speed again over the remaining few miles to finish with one km at LT at least so salvaged something. Warm day around 18 degrees, was surprised how few people were out along the river. Saw a few shoots of wild garlic, that will be everywhere soon. P&D can be a bit much at times. I don't follow it but I do use it for inspiration. I did laugh at the fact the first run after what would have been my 20 miler last week (I did 21) was 8 miles with LT. Uh, no. Recovery run for me. 16 miles today. Perfect, lovely weather, of the sort that is usually a joy to run in, but today it felt like a real slog. Legs were heavy, back ached and I just wanted to get it over with. I tried to distract myself by enjoying the blossoms and wildlife and so forth. I did spot a little brown speckly bird by the eco pond on Tooting Common (a big, reedy area which used to have water in it but doesn't have much any more). I think it may have been a reed bunting. I think I also spotted a mistle thrush on Wandsworth Common. Looked like a thrush, but big, with lighter brown feathers. The Canada geese on Wandsworth Common's pond were making a hell of a racket and when I returned to Tooting Common, the Canadas were honking there, too. Is it mating season for them at the moment? The Egyptians were chilling on the side of the big pond at Tooting with their brood - all doing well. The only time available for me today was about 6am. went straight out and took advantage of the calm day with morning sun and managed to hammer out a 20 miler! Furthest ever. I am a seasoned half marathoner with aspirations of doing a marathon maybe in the autumn or next spring. I have been gradually upping the miles on my LSRs but this is my longest yet. Is it wise to 'run the distance' in training before the actual race? Welcome, james, and well done. Generally speaking, no - most marathon plans max out at 20 miles and some of the more advanced ones go to 22. Going further than that isn't particularly beneficial, since it requires too much recovery time and that will negatively impact the rest of your training in the following week(s). Good effort this morning Cal and congrats on the 5k PB. Always nice to set a new PB. Welcome James. That's a great run considering you have no immediate plans to run a full marathon. Do you often push out long distances like that for fun? I went out nice and early today to get my 14 miles done. My legs definitely felt tired for the first few miles and I had to make a pit stop at the McDonalds along my route to pop to the loo (first time I've ever needed to that in training). I also had the return of that pain I was suffering with a few weeks in my left foot which was worrying but thankfully it seemed to ease off after a while. I ended up running the second half quicker and felt strong at the end so that was a nice little confidence booster going into the last 2 weeks. Thanks - for me its just a head thing knowing youre good for the distance. It helps but as you say it does take it out of you! I was thinking maybe doing this kind of distance on a monthly basis? I quite often do 10 - 12 miles, in fact probably a couple of times a week. I seem to settle into a pace after a couple of miles and just carry on. Once a week I do a higher intensity run between 5 - 10 miles running against a colleague (17 years younger so keeps me on my toes. 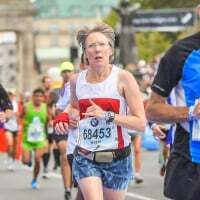 Now and again I go long and with my bucket list ambition of a marathon (54 years old) I wanted to see how it felt after 20 miles. Now I know! ps I have no idea why its gone to italics. james - I'm in the older camp (51 going on 52) and what I will say is you do need to be a little careful in order to avoid overuse injuries (god knows I am riddled with them!) But I definitely like to get a few runs of 20 or more mile in before each marathon. My best result was at Chester in October and I did 1 20 and 3 21s. Going into Vienna, I've done a 20, a 21 and a 22. My body is complaining but I have bags of stamina! As long as you remember to include a cut back week every 3-4 weeks you should be good to go. Nice running, alipat. I hope the foot behaves. Good persistence Hazel, even with my limited experience I can appreciate how good it feels to push through. Great run James, 20 miles must give you confidence that you can run the big one, as long as you don't have too aggressive a goal. Ali good second half, hope the foot is fine. I did the Lea Valley half today, my first HM. As always seems to be the case when I do an organised run, it was much hotter than I could have reasonably expected. I went off too fast, but based on my Watch I thought I was on track to break 2h5. Sadly the GPS was out, which meant the race went around 700m further than I expected. Enough to push me outside my goal window. My chip time was 2:06:12, which is a frustrating 12 seconds outside my goal. Had I known I think I could have made the goal. Oh well, lesson learned and still feels good to finish my first half, especially after being ill only 5 days ago. Given that I've only been running more seriously for a few months, I'm not too upset. Note on LV, it was a nice venue, picturesque, some geese and nice views. Recommended. Great running everyone! It sounds like it was a productive weekend for all. On everyone's recommendations, I entered my local Canterbury Riverside 10k, and had a great time! My first event since I started running this year and really enjoyable morning. The route though the Stour Valley is absolutely stunning, and the more people from the running community I meet, the nicer they seem. I woke up the an absolutely beautiful morning for running here in Kent; cold with a touch of frost, but zero wind and bright sunshine, and thought it's perfect for going for a decent time. My plan was to set up a 7:30 min mile pace and hold on as long as possible!! Unfortunately I coudn't!! , but I averaged 7:50 and ended up with 63rd place and 48:34. It was also my first exposure to really sharp, athletics type runners! Young lads leaving me for dust! One managing a 33 min 10k. Time for a couple of days off. I did a measly 20 miles last week and my painful ankles are starting again, so I am going to take it real easy with upping the miles this time, and hopefully get to high mileage weeks without setbacks. Linton, that's a great time. If it's any consolation, you're much quicker than me. enrvuk - satnav isn't always to be trusted - it estimates the route you took between each point where it finds you and it doesn't always get that right. It's always smart to leave a little wiggle room. Nonetheless, that's still a good result. In my first year of doing a lot of halves (I did 8 in 2015, although there was one back in 2011 followed by a few years out with a variety of problems) I went from 2:12:47 to 2:02:32 so keep plugging away. (I will say that's down to "newbie gains" as it's taken me until now to get another 9 minutes off). Thanks Cal. Yes, a lesson learned. Every other measured run I've done the gps showed lower than actual distance, so I thought my 90 seconds would be enough buffer. I now realise there is a potentially much bigger variance! Not that I had much in the tank, but 12 seconds is always doable over that distance. There were a few mile markers on the course, but as it was a 10k and HM day, they were a bit confusing. I've got another half planned in October. I have no idea how you managed 8, that's extremely impressive as is the improvement! 10 mins in a year is some going and now 20+ mins quicker than your first time. There is hope for me yet, although on my next planned training run I'll have hit the big 5-0! Have a good running week everyone, I'm taking it very easy via Amsterdam and Istanbul before running again next weekend. Cal I'm more or less following P&L rather than P&D at the moment as I'm focusing on distances from 10k to HM. I think this type of progressive long run with LT miles at the end doesn't feature in P&D (fortunately - they are very tough!). Well done for getting the 16 miler done, good nature spotting. Welcome to James. Cal has already said it all regarding going the full mara distance in training. It is a big jump from 10-12 miles to 20 - many mara plans increase long runs by around 10 % each run building up over several weeks. If you could do a one-off 20 miler then well done but if you want to regularly do longer runs I would build them gradually and cut back every few weeks. Hope the left foot issue was very temporary alipat. Congratulations on getting your first HM ticked off enrvuk. You were close to your goal time despite the warmth and your lurgy so a great result, you should be able to do that another day. I think a former poster on her (Nessie73) runs quite a bit in the Lea Valley. Pleased that you tried out the 10k LTT and that is certainly a good result! Hope Will and dad got on well yesterday. Just a bike ride for me yesterday - a bit more than 20 local mtb miles at gentle pace with OH. It was such a nice day we couldn't stay inside. Back out running later. Hello all! Great to see it so busy one here. 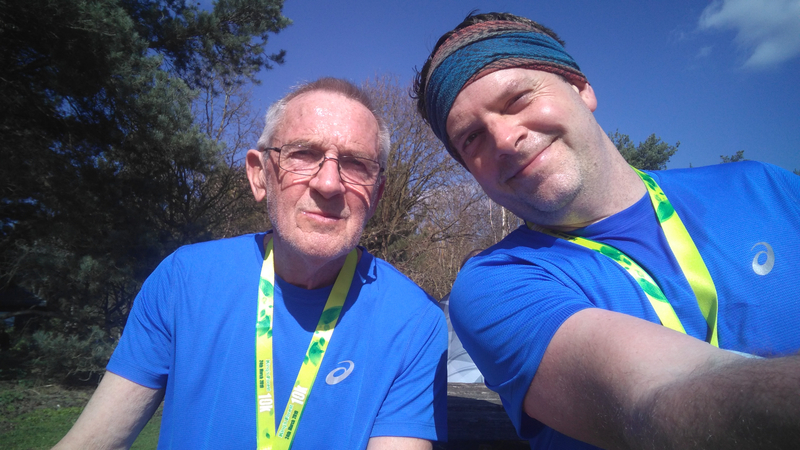 Well, it was a lovely day for my Dad's 10K debut yesterday, if a bit on the warm side. The course was looking fantastic. Gorse bushes in full bloom, Skylarks and Chiffchaffs singing all over and at least 5 Brimstone butterflies. We set off at a decent pace, aiming for sub-60 and the first mile, around the lake, was 9:15. Dad started to struggle a bit for the next 2 miles as he got a taste of proper trail running. It was very sandy in places, lots of tree roots and rabbit holes to dodge and full on sun, so it was understandable. He kept on plugging away though and the second half was more comfortable and faster, despite a couple of nasty uphill sections. Luckily I had worn my bottle belt which kept us both hydrated. A real push over the last mile and we crossed the line together in 1:02:58 (also it was a 10.32km course). Mum was a bit worried about Dad as he looked a bit rough, but 2 mins later he was recovered and looking fine again. Good old liquorice allsorts! Disappointed to not go under the hour, I think he did alright (to say the least). 104/186 and first in the 70+ category by 11 minutes! Hope I'm that fit at 74. Welcome,James,fantastic 20 miler,I'm in the same boat as you,plenty of HM,have my first full marathon in October. Nice 14 miles,alipat,always better to run your second half quicker.Hope your foot injury clears up. Well done on your first HM,envruk,you'll beat your goal on your next HM.Unlucky that you came down with the lurgy before your race. Great 10k race,Linton,fantastic time.Glad you enjoyed the race day experience.Hope your ankle injury clears up. Wow,Will,pass on my congratulations to your Dad.Very inspiring,hope I'm still running at that age.You'll have to get some father and son T-shirts for your next race together.My Dad is only a year older and I know what he'd say if I asked him to go running with me! Nearly forgot,well done to you,Will.Great photos,looked like a lovely day for a race. 10 easy miles this afternoon,9 on the canal,1 around town.